After the house is decorated, put some holiday music on and snuggle up to a hot cup of cocoa. Here's Alton Brown's recipe for homemade instant hot cocoa mix. It's delicious, free of additives, and mixes up in a jiffy. Make an extra batch and give them away as Christmas gifts. Simply fill half your mug with the mix, add hot water and stir. MMmmmmmmm. This recipe includes a little heat from a pinch of cayenne pepper. I added more of a dash, which was a little too much for my son Ethan, although he is eagerly drinking it up. Add it conservatively at first. Seal the unused mix (without the water) in an airtight container. Will keep in the pantry indefinately. For a richer drink, you can also use the mix with warm milk. To give as a gift, package in decorative tins, or jars with decorative fabric wrapped on the lid with a rubber band. 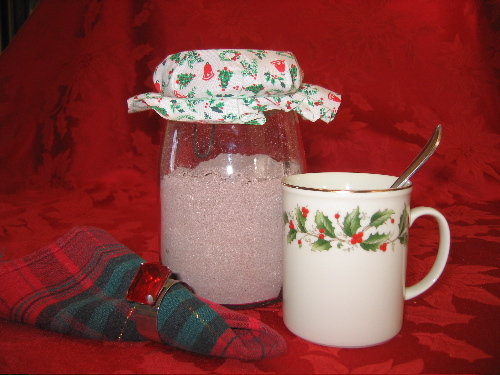 Add a small card with instructions for use, such as "Fill mug half full with mix; add hot water and stir." Here's a super simple way to dress up pretzels or dried apricots for a festive touch at a party or for holiday giving. All you need are pretzels, chocolate chips, and dried apricots. Any shape of pretzel will work, but the "rod" or stick style is easiest. Simply melt the chocolate chips over a double boiler or in the microwave (be careful not to scorch it!) and apply the melted chocolate to the pretzel. Then roll it in decorative sprinkles, and set it aside on waxed paper to dry. I found that it was best to pour the sprinkles into a long and narrow, flat-bottomed plastic container. 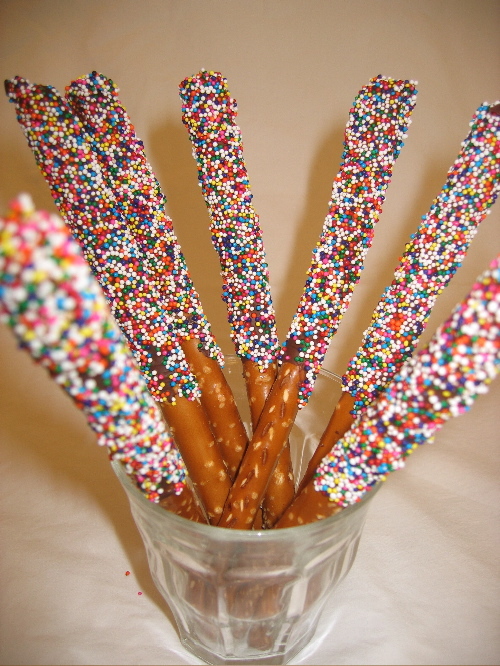 If you use a plate, be sure the rim does not get in the way of the pretzels when you roll them in the sprinkles. To apply the chocolate to the pretzel, I rolled it across the end of a rubber spatula that held a generous blob of chocolate. Shake the excess chocolate off the pretzel before rolling it in the spriinkles. 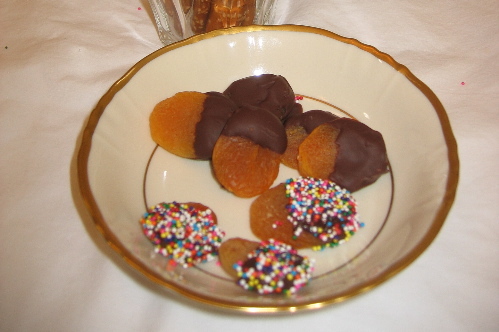 Chocolate dipped dried apricots are an elegant and tasty gift. For variety and a little more color, dip some of them in sprinkles too. Making these treats is so simple, and children love to help!